While waiting to set up a Tech Counselor visit in early May, I started messing around with the frames for the wing tip lights. As I said in an earlier post, I bought the Van's kit, but then realized that I had to rebuild most of it myself because I am only going to have one light in the fixture. The Van's kit for the 7 allows for two Halogen lights in each tip. With the 50 watt HID lights, one will be plenty bright enough. Just a quick note.. There are some builders who haven't had much success with the tip landing lights. I think there are three points that will help provide me with better results, also, I do think they are the coolest looking light option, so I hope they work well. I am using 50 watt HID lights, vs the halogen lights provided in the kit. Tons more light ! 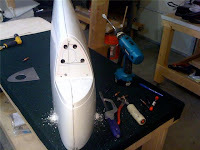 I have the newer wing tips that have a larger cut out and allow the light to be pointed closer to centerline. I have been able to enlarge the hole in the aluminum face dramatically since I am only using one light vs. two, so there should be less interference to the beam. So I started measuring and cutting the fiberglass tip. For not doing any research on this topic, I think overall it turned out pertty good. Still need to do a bit of sanding on the inside cut, but the frame fits and looks pretty great so far. 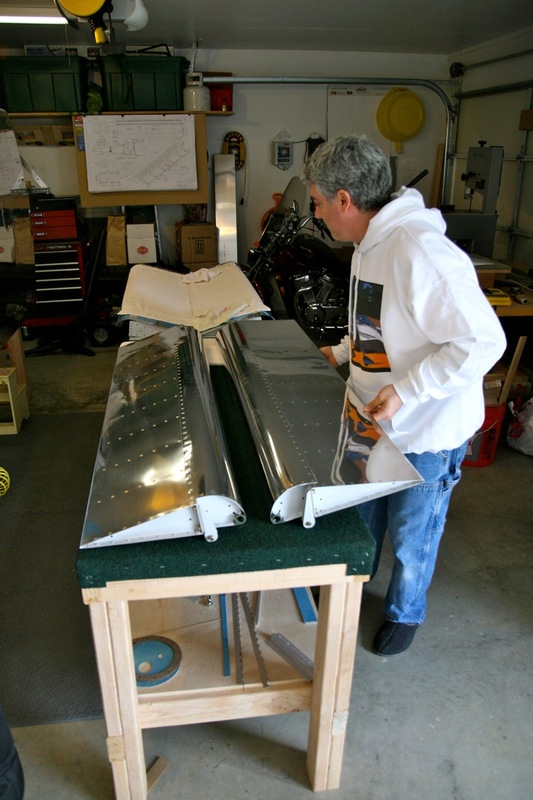 When I was researching and planning on building an RV-7 I saw lots of people who shared tools and received hand me down fixtures from other builders etc. I never thought it would happen to me, but I have been very lucky and people in this tight nit group are very generous. I went up to Arlington to help a fellow builder mount his wings on his 7, and his plane sure is looking good. Lots of inspiration for me, but best of all, he had one of the best wing cradles I have seen and no longer has a use for it. So perfect for me, I snapped it up and the timing couldn't be better. My wings will come off the racks and go into the Cradle in a week or so. The wings will be in the cradle for about a year or so, then onto the next builder the cradle will go. Some of the guys from the local EAA 1440 chapter came over this weekend to look at my wings. Everything was prepped and ready. I got lots of positive feedback and hopefully inspired a few other builders to get back at it. I am setting up for a techincal counselor to come by in the next couple weeks to make sure everything looks good. 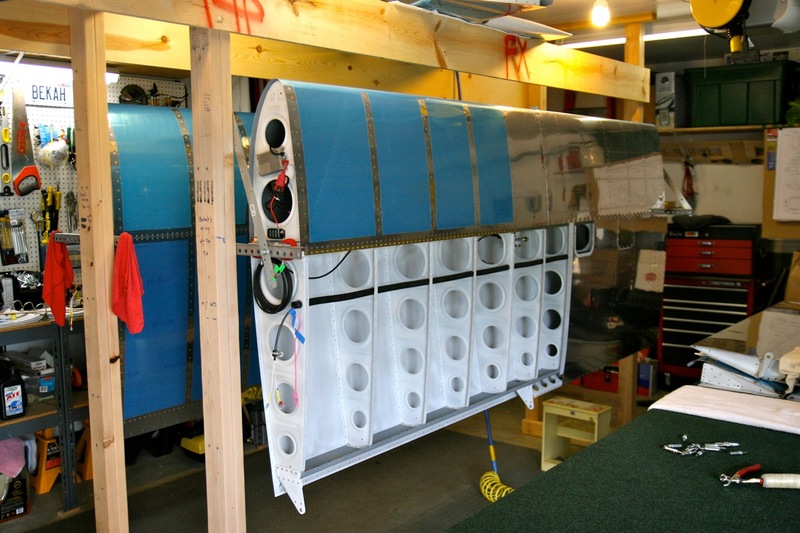 The left inboard bottom wing skin is now complete as well. Pictures will be up soon but I wanted to post a quick status. Now I am working on the outboard skins prep. Most likely I will wait to rivet these on as I am going to schedule a FAA technical councilor visit to look through my wings and provide feedback. The last skins will go on pretty quick, so no rush there and I would rather wait to make sure all is clear before I go forward. Also, this weekend I am having a pseudo project visit so the guys from my EAA chapter can come over and check out my progress and provide feedback. We'll see how that goes. Fuse is coming in May ! ! 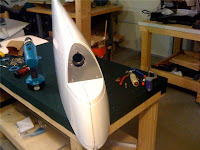 I will be ready..
Straight from the right wing I am now working on the left wing inboard bottom skin. You definitely learn a lot about building airplanes from every step, this wing is 90% easier than the right. I can only imagine how good you get after building 2 or 3 planes. ;-) Now I know what they mean when they say you learn as you go, and it gets much easier. Anyway, this wing is looking good, about 1/2 way done with the inboard skin at this point. Bekah has helped me about 15 minutes so far and will need one more 15-20 minute session before I can finish. Basically she is helping with the rear spar riveting between the access panels. Most everything else I can now get myself on this wing. Getting a good plan together for the bottom outboard skin as I go. Over the last couple days I was able to finish riveting the inboard lower skin. Next I will work on the same skin on the left wing.. Then Finally I will be to the Quickbuilt stage with my wings.. My 1 year project anniversary is coming up.. Just to get to the quickbuild wing status.. OMG... Oh well, it was fun..
Today was a long day completely focused on the right flap. I primed it yesterday and riveted it today. Got through the entire flap in about 2.5 hours. Things on the wings are wraping up. Next step is figuring out how to rivet on those bottom skins. Will need to pull Bekah in on this one. The weather in Seattle has been horrible this Easter weekend, which means I couldn't prime and work on the last flap which is really the final part of the wings that I need to do, besides the bottom skin. We did have lots of family over today though so not being able to work on the plane wasn't that big of a deal. Actually earlier in the weekend, I was able to start working on some misc stuff just to keep busy... Also, I don't want to get down to the final stretch and have that huge list of misc items, so I am getting the work in while I can. I picked up a labeler that prints on heat shrink tubing and started labeling the wires in my wings and installing the terminals. A fellow RV builder down in Arizona tipped me off on the labeler. It's great and hopefully will save lots of time down the road. Also, you can see that I am mounting my HID Landing Light Ballast on the tip and generally finding places for the terminal blocks etc. Nothing is permanent yet, I am using tooling holes where possible to anchor the parts. Here are the tip and root terminal blocks. I will be using Fast-On connectors on the root so that access is quick and easy when necessary. I also started working on my Tip Light fixtures. I won't get into the fiberglass work just yet, but wanted to test out building the fixture from scratch. Well, not completely, I had some parts from the Vans kit, but I built most of it myself because I wanted a single light in the tip, and the Van's kits come with two. Last night I riveted away and finished up the left flap. Tricky in spots, but overall turned out pretty good. I kept checking to make sure it was straight but you really don't have the ability to rivet it like the aileron on a flat table. By the time you can get it to a flat table, most of the rivets holding it together are set. Anyway, at the end of the day I was able to put it on a flat table and I couldn't identify any twist. That is all I can hope for..
Now it is onto the right flap, then finishing up the bottom skins and the wings will be structurally complete ! At this point, however, I have decided to abandon the project all together. Realizing the impact it has on my life and the expectation of 2-3 more years of this really is starting to get to me. It will be sad to give it up, but probably better for my state of mental health.. I will be donating my wings to the societad du avion aou francis early next week.